Identification: Alligator mississippiensis is a robust crocodilian with a total length of 1.8-5 m (6-16.5 ft), and a record length of 5.84 m (19 ft 2 in) (Conant and Collins, 1998). American alligators can be distinguished from Crocodylus acutus, the American crocodile, and Caiman crocodilus, common caiman, by the presence of a broad, rounded snout, without conspicuous teeth protruding while the mouth is closed (especially the lower 4th tooth) (Behler and King, 1979; Conant and Collins, 1998; Powell et al., 1998). Unlike C. crocodilus, alligators lack a prominent bony ridge in front of and between the eyes (Behler and King, 1979; Conant and Collins, 1998; Powell et al., 1998). See the species accounts titled "Crocodylus acutus (Cuvier, 1807)" and "Caiman crocodilus (Linnaeus, 1758)" on this website for comparison. The general dorsal coloration is black, but light juvenile markings may be present in adults; young have bold, yellowish crossbands on a black background (Grenard, 1991; Conant and Collins, 1998). The voice of both males and females is a throaty, deep, bellowing roar (McIlhenny, 1935; Elliott, 1994; Conant and Collins, 1998). Elliott (1994) has made a recording of this penetrating roar available on a CD. Females may grunt like pigs when calling to their young (McIlhenny, 1935; Conant and Collins, 1998). American alligators have been illustrated by numerous authors over the years; the list provided here is not exhaustive (Reese, 1912; McIlhenny, 1935; Neill, 1971; Guggisberg, 1972; Carr, 1973; Mount, 1975; Perrero, 1975; Smith and Smith, 1977; Behler and King, 1979; Toops, 1979; Martof et al., 1980; Smith and Brodie, 1982; Garrett and Barker, 1987; Webb et al., 1987; [Sievert] and Sievert, ; Dundee and Rossman, 1989; Hirschhorn, 1989; Lazell, 1989; Ross, 1989; Ross and Magnusson, 1989; Ashton and Ashton, 1991; Carmichael and Williams, 1991; Glasgow, 1991; Grenard, 1991; Mahony, 1991; Ross and Ernst, 1994; Palmer and Braswell, 1995; Lamar, 1997; Conant and Collins, 1998; Magnusson, 1998; Powell et al., 1998; Bartlett and Bartlett, 1999a, b; Behler, 1999; Zug et al., 2001). Native Range: The indigenous range of A. mississippiensis is from coastal North Carolina south to southern Florida and the Keys, and westward through the Deep South to central Texas and extreme southeastern Oklahoma (Martof, 1956; Duellman and Schwartz, 1958; Webb, 1970; Mount, 1975; Stevenson, 1976; Martof et al., 1980; Lohoefener and Altig, 1983; Garrett and Barker, 1987; Groombridge, 1987; Moler, 1988; [Sievert] and Sievert, ; Carpenter and Krupa, 1989; Dundee and Rossman, 1989; King, 1989, 2000; Lazell, 1989; Ross and Magnusson, 1989; Ashton and Ashton, 1991; Carmichael and Williams, 1991; Gibbons and Semlitsch, 1991; Grenard, 1991; Ross and Ernst, 1994; Palmer and Braswell, 1995; Conant and Collins, 1998; Bartlett and Bartlett, 1999a, b; Behler, 1999; Dixon, 2000; Meshaka et al., 2000). American alligators may eventually be found in Mexico in localities adjacent to the Texas border (Smith and Smith, 1976, 1977, 1993; Ross and Ernst, 1994). Over much of its range A. mississippiensis has been eliminated, making an accurate determination of its modern distribution difficult (Ross and Ernst, 1994; Conant and Collins, 1998). Table 1. States with nonindigenous occurrences, the earliest and latest observations in each state, and the tally and names of HUCs with observations†. Names and dates are hyperlinked to their relevant specimen records. The list of references for all nonindigenous occurrences of Alligator mississippiensis are found here. Means of Introduction: In most instances A. mississippiensis shows up in nonindigenous localities because they are escaped or deliberately released pets; these include animals introduced to New York (Mikkelson and Mikkelson, 2001), Union County, New Jersey (Mikkelson and Mikkelson, 2001), West Virginia (Green and Pauley, 1987), Virginia (Mitchell, 1994), Indiana (Minton, 2001), Oklahoma (Webb, 1970; [Sievert] and Sievert, ), Boulder, Colorado (Livo et al., 1998), and probably Arizona and North Carolina. The alligators spotted in Essex County, New Jersey, may have escaped a lagoon in Military Park, Newark (Anonymous in Mikkelson and Mikkelson, 2001). Perhaps they had been part of a public animal display. The A. mississippiensis collected from Mesa County, Colorado, escaped from a roadside zoo (Livo et al., 1998), while the one collected from the Colorado River in California had been released (intentionally?) from a traveling carnival (Bury and Luckenbach, 1978). Conant (1977) suggested that an animal dealer intentionally established the A. mississippiensis population found in the Brownsville area of Cameron County, Texas. Status: All the American alligators found in New York have been collected (Anderson and Habuda, 2001; Anonymous, 2001a, b; Beebe, 2001c; Heaton-Jones, 2001; Mikkelson and Mikkelson, 2001). They are not established in this state nor could they survive the cold winters, and the story of alligators dwelling in New York City sewers is simply a well-entrenched myth (Mikkelson and Mikkelson, 2001). One of the alligators found in Union County, New Jersey, was collected; although there is no further word about the success of the 1933 great gator hunt started on the Passaic River in Essex County (Mikkelson and Mikkelson, 2001). All A. mississippiensis from Virginia, West Virginia, Indiana, and California were collected with no further evidence of established populations (Bury and Luckenbach, 1978; Green and Pauley, 1987; Mitchell, 1994; Minton, 2001). Palmer and Braswell (1995) provide little detail of nonindigenous A. mississippiensis in North Carolina, but suggest some individuals are "thriving." There is no evidence of reproduction. There is a possibility that introduced American alligators in Oklahoma may establish populations in or near the southeastern corner of the state; thus interacting with indigenous populations in this region ([Sievert] and Sievert, ). The A. mississippiensis populations in the Brownsville area, Cameron County, and the surrounding lower Rio Grande Valley are established but some authors suggest they could be nonindigenous (Conant, 1977; Conant and Collins, 1998). Since alligators were reported from the Brownsville region before the presumptive introductions took place (Baird, 1859), they are probably indigenous (Ross and Ernst, 1994). Indigenous populations may have simply been augmented by intentional introductions (Conant, 1977). The A. mississippiensis in Boulder, Colorado, was collected (Livo et al., 1998). Only one of the American alligators was collected from the Colorado River, Mesa County, Colorado; the other was never recaptured, but there is no evidence of an established population (Livo et al., 1998). The American alligators from Phoenix, Arizona, were collected (M. Demlong, personal communication 1997); however, Howland (1996) lists this species as "not well established" in Arizona. Impact of Introduction: There is no evidence that any of the nonindigenous occurrences of American alligators have had any impact on indigenous ecosystems; however, an established population of these massive carnivores in a southwestern state could negatively impact indigenous fauna. The introductions in Oklahoma, and the presumptive introduction in Cameron County, Texas, could compromise the genetic integrity of extant indigenous populations. As mentioned above, the status of indigenous alligators in Oklahoma could be obfuscated, thus creating difficulties when deciding conservation measures and future protective legislation. A large alligator is a potentially dangerous carnivore. While attacks on humans are exceedingly rare, they do occur on occasion (Pooley et al., 1989; Ashton and Ashton, 1991; Anonymous, 2002). Remarks: The taxonomy of A. mississippiensis has been reviewed or summarized by Smith and Smith (1977), King (1989), Ross and Ernst (1994), and Crother et al. (2000). 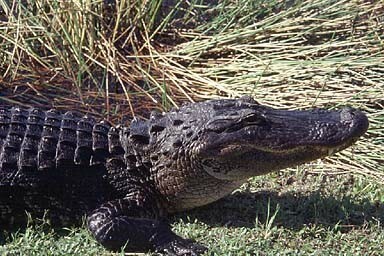 Liner (1994) provides a Spanish vernacular name for the American alligator. Brisbin et al. (1986), Gibbons and Semlitsch (1991), and Ross and Ernst (1994) provide the best literature reviews of the natural history of alligators. A variety of authors have contributed to or summarized the natural history and biology of American alligators (Reese, 1912; McIlhenny, 1935; Neill, 1971; Carr, 1973, 1976; Mount, 1975; Lang, 1987, 1989; Dundee and Rossman, 1989; Vliet, 1989; and a variety of contributions compiled by Webb et al., 1987). Scientific and standard English names follow Crother (2008). Alligator mississippiensis is an aquatic, omnicarnivorous reptile capable of living in many types of waterways, both natural and man-made, and feeding upon almost any fauna it can catch (McIlhenny, 1935; Neill, 1971; Mount, 1975; Dundee and Rossman, 1989; Ashton and Ashton, 1991). Some alligators dig deep holes with connecting dens than can remain filled with water during droughts, thus maintaining an aquatic environment for indigenous fauna (McIlhenny, 1935; Neill, 1971; Carr, 1973; Dundee and Rossman, 1989; Grenard, 1991). Courtship and mating involves complex visual and auditory displays directed at prospective mates and competitors (McIlhenny, 1935; Lang, 1987, 1989; Vliet, 1989). The female buries her hard-shelled eggs in a nest she constructs of dead vegetation and the surrounding muck (McIlhenny, 1935; Dundee and Rossman, 1989; Ashton and Ashton, 1991). Females exhibit varying degrees of parental care by guarding the nest, releasing hatchlings from the nest and eggs, and transporting them to water in her mouth (Kushlan and Simon, 1981; Lang, 1987; Shine, 1988; Magnusson et al., 1989). Young may remain in a protective crèche with the mother and sometimes other adults for a considerable length of time, sometimes exceeding a year (Lang, 1987, 1989; Shine, 1988; Magnusson et al., 1989). American alligators are subject to a variety of state and federal regulations (Levell, 1997); they should not be obtained by anyone before such legislation is understood along the responsibility that goes with keeping them as captives. Carr, A. 1973. The Everglades. Time-Life Books, [New York]. 184 pp. Grenard, S. 1991. Handbook of Alligators and Crocodiles. Krieger Publishing Company, Malabar, Florida. 210 pp. Groombridge, B. 1987. The distribution and status of world crocodilians. Pp. 9-21. In: G. J. W. Webb, S. C. Manolis, and P. J. Whitehead (editors). Wildlife Management: Crocodiles and Alligators. Surrey Beatty & Sons Pty Limited, Chipping Norton, Australia. 552 pp. Guggisberg, C. A. W. 1972. Crocodiles. Their Natural History, Folklore and Conservation. Stackpole Books, Harrisburg, Pennsylvania. 204 pp. Hirschhorn, H. H. 1986. Crocodilians of Florida and the Tropical Americas. The Phoenix Publishing Company, Miami. 64 pp. + errata. Lamar, W. W. 1997. The World's Most Spectacular Reptiles & Amphibians. World Publications, Tampa. 210 pp. Lang, J. W. 1989. Social behavior. Pp. 102-117. In: C. A. Ross (consulting editor). Crocodiles and Alligators. Facts on File, Inc., New York. 240 pp. Levell, J. P. 1997. A Field Guide to Reptiles and the Law. Second Revised Edition. Serpent's Tale Natural History Book Distributors, Lanesboro, Minnesota. 270 pp. Liner, E. A. 1994. Scientific and common names for the amphibians and reptiles of Mexico in English and Spanish. Nombres científicos y comunes en Ingles y Españole de los anfibios y los reptiles de México. Society for the Study of Amphibians and Reptiles Herpetological Circular (23):i-vi, 1-113. Moler, P [E.]. 1988. A Checklist of Florida's Amphibians and Reptiles. Nongame Wildlife Program, Florida Game and Fresh Water Fish Commission, Tallahassee. 18 pp. Neill, W. T. 1971. The Last of the Ruling Reptiles: Alligators, Crocodiles, and Their Kin. Columbia University Press, New York and London. 486 pp. Ross, C. A., and W. E. Magnusson. 1989. Living crocodilians. Pp. 58-73. In: C. A. Ross (consulting editor). Crocodiles and Alligators. Facts on File, Inc., New York. 240 pp. Smith, H. M., and R. B. Smith. 1976. Synopsis of the Herpetofauna of Mexico. Volume III. Source Analysis and Index for Mexican Reptiles. John Johnson, North Bennington, Vermont. 23 pp., Am-T, App-102, Cor-4. Smith, H. M., and R. B. Smith. 1977. Synopsis of the Herpetofauna of Mexico. Volume V. Guide to Mexican Amphisbaenians and Crocodilians. Bibliographic Addendum II. John Johnson, North Bennington, Vermont. 191 pp. Webb, G. J. W., S. C. Manolis, and P. J. Whitehead (editors). 1987. Wildlife Management: Crocodiles and Alligators. Surrey Beatty & Sons Pty Limited, Chipping Norton, Australia. 552 pp.